Nowadays, people don’t draw on paper, they draw on coffee drinks ha-ha. 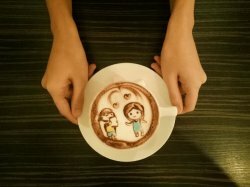 Thinking another way to show your best wishing to your friends and family, art on coffee will be one of the great ideas. Bookmark coffee can help you to send your wishing through coffee with any art you want to draw on the cup of coffee. They are specializing in serving you the most unique cup of coffee that only you have it to drink. My friend knows I love coffee art very much so she brought me here to get me some coffee treat for my birthday. Before we walked upstairs to the coffee shop, we saw there is a mathematics equation on their board and people have to solve and get their password. *Wondering who will stand there and solve it ha-ha*. maybe that was a weekend. Then, we ordered our coffee and ask about the coffee art we want. 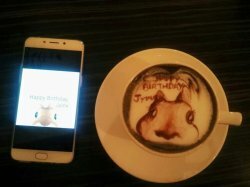 The barista was really friendly and ask us to send the photos we want through whatsapp. Drinks came and phone eat first as usual ha-ha. And I don’t really wanted to stir my coffee as the art was so cute and can said as 95% looks alike to the real photos. 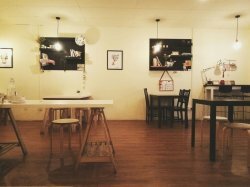 The atmosphere is simple and peaceful matching with soft background music and surrounded with pictures on the wall with quotes.